We've searched high and low to find the best Olympus PEN E-PL9 deals the internet has to offer, so if you're thinking about buying the company's latest mirrorless body you're in the right place. Read on for the best Olympus PEN E-PL9 prices from the most reputable retailers. Olympus has been all about winning the hearts and minds of the blogging community lately, certainly as far as its PEN range goes. 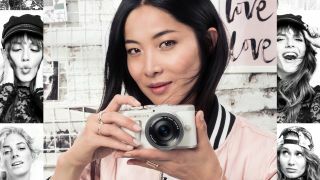 Its newest offering in the entry-level E-PL9 is based on the classic film cameras from the 60s and 70s, yet it comes with more modern must-have features. These include a touchscreen LCD that can be angled to face the subject, as well as 4K video and its maker’s Art Filters options. Yes, such filters are now present on every mobile phone and tablet, but Olympus arguably pioneered their use on digital cameras almost a decade ago. For easy image sharing, we also have both Wi-Fi and Bluetooth connectivity. An advanced mode also accesses multiple exposure, focus bracketing and HDR options, so there's the opportunity to exert more hands-on control on the image-making process if so desired. However it’s equally possible to leave the Olympus PEN E-PL9 on ‘auto everything’ and come away with more than acceptable results. As ever, the best value option is the kit that includes a compact M.ZUIKO DIGITAL ED 14-42mm 1:3.5–5.6 EZ pancake zoom, although the camera is compatible with a plethora of other lenses in the Micro Four Thirds system from Olympus and the likes of Panasonic. As well as offering a Micro Four Thirds mount, something also shared with Panasonic on this model is the ability to capture 4K video clips, which here happens at a respectable maximum frame rate of 30fps. As for any negatives, the camera does without a standard viewfinder, and has a physically smaller sensor than many rivals. At 16MP, resolution is a little short of the 20-24MP standard too, but the camera's image quality reveals that 16MP is still more than enough to deliver sharp, detailed images. The Olympus PEN E-PL9 also performs better than one might expect at higher ISO settings, particularly if you stick to ISO 1600 or below. Auto white balance also does a competent job and we rarely found ourselves needing to adjust its exposure compensation settings. Given all of the above, the E-PL9 adds up to an ideal compact system camera option for first-time buyers, with the option to choose from white, black or brown camera bodies. Scroll down for more of today's best Olympus PEN E-PL9 camera deals.